The overwhelming sentiment that greeted our story on the gas consumption maps the Natural Resources Defense Council and the Sierra Club put out last week went something like this: These are almost useful. Just about everyone agreed that looking at total fuel consumption per county wasn’t very informative without weighing that number against population. There were problems with doing per-capita fuel comparisons, but after hearing from several sources (including Streetsblog) that it was needed, NRDC’s Deron Lovaas has put out a follow-up post with new maps and charts that have, in my opinion, much more useful information. This per-capita map of gas consumption provides more nuance than the previous map, giving totals per country, but it still doesn't answer all the questions. Graphic: NRDC. As Lovaas mentioned last week, there are problems with this map too. Some of these places are so rural and lightly populated that massive per-capita fuel consumption just isn’t a big enough problem to worry about, since there are few capitas there. Plus, there’s the problem of through-traffic — in many rural states, most traffic neither originates nor ends up there. So, since NRDC and the Sierra Club designed these maps, in part, to help them strategize where to focus their efforts, this per-capita map is of limited value. 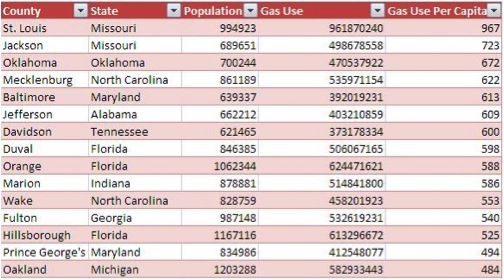 This table takes the top gas-guzzling counties and ranks them based on per capita gas consumption. Chart from NRDC. It goes on like this, giving a sense of where there are large concentrations of people who are all over-consuming gasoline. Keeping in mind that Lovaas is skeptical of the Missouri data, it goes from 672 gallons per person per year in Oklahoma to 192 per year in Los Angeles. The value of this comparison is clear when you realize that the initial map should L.A. looking like the real problem in terms of total usage, consuming 1.9 billion gallons of gasoline a year, while the new chart shows far more urgent needs elsewhere in the country. In some places, those needs are being addressed. Mecklenberg County, North Carolina may see its numbers drop as a result of increased use of its new light rail system and, especially, Charlotte’s wisdom in concentrating development along those new transit corridors. What has long been derided as an unwalkable city is finding its legs. Oklahoma City’s mayor, Mick Cornett, has started an active transportation revolution in the country’s fattest city, building walking paths, bike lanes and a streetcar line. Meanwhile, Hillsborough County, Florida, lost an opportunity two years ago to mend their gas-guzzling ways. In a year when 77 percent of ballot initiatives to support transit were approved, Hillsborough residents went their own way, voting to defeat a one-cent sales tax for transportation. Seventy-five percent of that money would have gone to public transportation. Meanwhile, Oakland, Michigan, two down from Hillsborough on NRDC’s list, voted 80 percent to 20 percent this August to support suburban transit with their property taxes. It’s good to see so many of these counties taking steps in the right direction. NRDC’s new resource identifies them as hot spots for the country’s oil addiction, and they’re exactly the places that should be building bike lanes and improving transit. These results still confuse me. Based on cross-referencing populations with Wikipedia, I feel fairly confident that “Baltimore” refers to the City of Baltimore, not Baltimore County. How are Baltimoreans using three times more gasoline per capita than Angelenos? Typo 5th paragraph: ” The value of this comparison is clear when you realize that the initial map should L.A. looking like the real problem in terms of total usage…” showed? wow.. look at Missouri. the whole state is as red as a ripe strawberry. Also, thank you for helping to get a fuller picture. Per capita consumption is very important because it says something about regional infrastructure which is the best place to start fixing the problem. I really like the two maps shown together. They’re almost inverses of each other because population density plays such an important role. @14a8960ffa19c6b0ffff4264aba1f641:disqus where you have counties that are essentially rural (or outright depopulated), per-capita consumption will be high because people travel a lot between towns/cities, even if intra-city traffic would be reduced. If you live on 15.000 pop. town, you will need to travel often to nearby places. LA has the second highest bus ridership behind NYC & a rail system inching on BART ridership, & likely to surpass it soon as more Measure R projects build out. The traffic is iconic, but you might be surprised how many people get around LA without cars. Well done NRDC! Thanks for listening to feedback. Rural counties don’t just reflect the longer driving distances, they are also far more prone to the effects of through traffic. All the gasoline purchased by everybody who drives across Montana, for example, gets divided by an almost nonexistent resident population. The red counties there clearly correspond to the interstate freeways. Targeting where the greatest absolute gasoline consumption is happening is certainly imperative for reducing CO2 emissions which, in my mind, is the highest priority for the planet right now. Per capita gasoline consumption highlights those regions most dependent on gasoline and most in need of radical change to adapt to the approaching realities of peak oil. Wealthy communities with current high oil consumption will have the resources to create mass transit or switch to private electric vehicles. The real problem is how the red areas above overlay with some of the lowest GDP per capita areas of the country. This population will experience economic pain and severe discontinuities in lifestyle with few resources to make the changes necessary for effective adaptation. Seems hard to believe that MO is that much worse than neighboring counties in different states. I suspect something is wrong with the data there. Any idea where trucking companies come up in this? My theory being that MO might have lots of long haul trucks registered there. It stands out way too much. How is farming factored in? Farming equipment could explain Missouri. Hennepin Minnesota ranks 17th. Very car centric in the burbs. I am 90% bicycle 10% bus. It would be interesting to see how close the refineries are in these counties. Hennepin gets a fresh Canadian supply to refine. The apparent answer Jeff’s question about Baltimore City vs. Baltimore County is that NRDC has computed Baltimore County’s gas use with Baltimore City’s smaller population. Baltimore County has a population of over 800,000. Using the correct population, per capita gas use in the county a little under 500 gallons. That seems about right. My guess for gas use in the city is about 250 gallons per capita. It is interesting that the other well know case of an independent city and sister county is Saint Louis. Among large counties, Saint Louis County appears to have the nation’s highest per capita gas use. 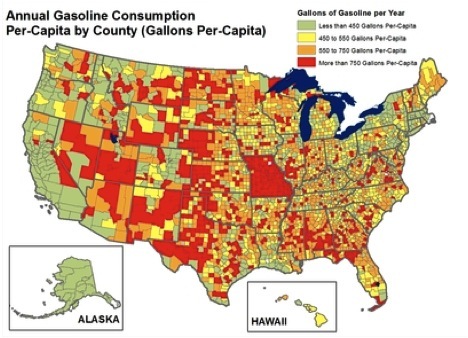 A cartogram (with the states or counties sized by total fuel use, for example) would be a great way to visually combine both maps! even in the center of the state, where that would not be a factor. So, if we can actually believe the numbers for Missouri, the best thing we can do is to raise Missouri’s gas tax to the level of Illinois’s gas tax? Which Counties Have the Biggest Oil Addiction Problem? We Still Don’t Know. The End of Peak Driving?